Student, Volunteer and Observing Opportunities! The Center for Speech and Language Disorders welcomes students, volunteers and individuals interesting in observing our center. We have some opportunities available for students interested in fulfilling college-level academic requirements for speech-language pathology. Please note that externship placements for graduate students must be arranged through your college or university. 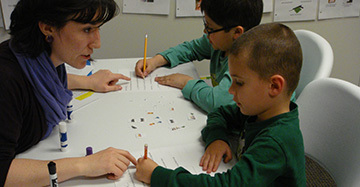 Participating as an aide in CSLD's Literacy or Social programs is an amazing hands on experience for any SLP student. The time participating can count towards required observation hours and provides an exciting work experience enhancing your knowledge and your resume! An aide’s first year working with CSLD in the literacy or social program is volunteer. However, there is the potential to be asked to return for future programs in a paid position! Please contact aide@csld.org for more information. In addition, we have general volunteer and observation opportunities for individuals in both therapeutic and support positions, based on availability and scheduling compatibility. Please note that while we make every effort to accommodate your volunteer/observation request, we may only be able to fulfill some requests. Students, volunteers and observers may be obligated to fulfill the following requirements by turning in specific paperwork. Please note that once you are contacted, you will receive the appropriate paperwork, and details on how to complete it from Human Resources.